Media Online (Situs Berita) Mulai Ditinggalkan Pembaca. Mashable memberhentikan 30 wartawannya. The Financial Times menghadapi kesulitan keuangan. Salon dan Buzzfeed juga mulai merumahkan karyawan selain memangkas anggaran. The transition from an Internet of websites to an Internet of Mobile Apps and Social Platforms plus AdBlock Apps. 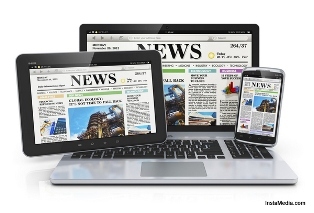 The business of online news has never been forgiving. But in recent weeks, what had been a simmering worry among publishers has turned into borderline panic. This month, Mashable, a site that had just raised $15 million, laid off 30 people. Salon, a web publishing pioneer, announced a new round of budget cuts and layoffs. And BuzzFeed, which has been held up as a success story, was forced to bat back questions about its revenue — but not before founders at other start-up media companies received calls from anxious investors. “It is a very dangerous time,” said Om Malik, an investor at True Ventures whose tech news site, Gigaom, collapsed suddenly in 2015, portending the flurry of contractions. The trouble, the publishers say, is twofold. The web advertising business, always unpredictable, became more treacherous. And website traffic plateaued at many large sites, in some cases falling — a new and troubling experience after a decade of exuberant growth. Online publishers have faced numerous financial challenges in recent years, including automated advertising and ad-blocking tools. But now, there is a realization that something more profound has happened: The transition from an Internet of websites to an Internet of mobile apps and social platforms, and Facebook in particular, is no longer coming — it is here. It is a systemic change that is leaving many publishers unsure of how they will make money. “With each turn of the screw, people began to realize, viscerally, that this is what it feels like to not be in control of your destiny,” said Scott Rosenberg, a co-founder of Salon who left the company in 2007. Audiences drove the change, preferring to refresh their social feeds and apps instead of visiting website home pages. As social networks grew, visits to websites in some ways became unnecessary detours, leading to the weakened traffic numbers for news sites. Sales staffs at media companies struggled to explain to clients why they should buy ads for a fragmented audience rather than go to robust social networks instead. The power shift was made clear last week as the Facebook chief executive Mark Zuckerberg took the stage for the company’s annual developer conference. He stood in front of a diagram outlining an audacious 10-year expansion plan, which included several features to help keep people inside Facebook’s world instead of following links out. Mr. Zuckerberg also spoke about his company’s ambitions to host TV-style live video, an initiative that some media companies, including The New York Times, are investing in seriously, despite uncertainty about the rates at which videos will be monetized. Facebook also announced that it would open up Instant Articles — which encourage publishers to post their content directly to Facebook — to “any publisher.” The company demonstrated chat bots, through which users can interact directly with media companies, including publishers, through Facebook’s Messenger app. “Messenger is going to be the next big platform for sharing privately, and for helping you connect with services in all kinds of new ways,” Mr. Zuckerberg said, after demonstrating a CNN chat bot on stage. At the same time, publishers pored over a report from the analytics firm Parse.ly, detailing how important Facebook had become to their business: Among sites tracked by the firm, more than 40 percent of web traffic came from the social network. Facebook’s users seem to be following Mr. Zuckerberg’s lead. NewsWhip, which tracks how publishers are performing across major Internet platforms, says the rate at which links to outside websites are shared on Facebook, compared with videos and Instant Articles, has declined. Liam Corcoran, NewsWhip’s communications director, says that in recent months a wide range of publishers have called him to ask whether sudden drops in Facebook reach are widespread, and asking how they might be remedied — as if they were asking how to cure a disease. “It’s a doctor’s office,” he said. So far, publishers are responding in a variety of ways. With the help of venture capital funding, companies like BuzzFeed and Vox are investing heavily in video production with a focus on TV and film. Others, like Mashable, are diverting resources to increasing their audience on Facebook, hoping that enough money — through revenue-sharing arrangements with the company — will follow. “We invest in a number of strategies, then figure out which strategies are most effective,” Pete Cashmore, Mashable’s founder, said in an interview. Others are planning to do less with less. “We talk about our business as though we’re in a shrinking market, and plan accordingly,” said Alex Magnin, chief revenue officer at Thought Catalog, an essay site. Online news sites have watched the rise of social platforms closely. Publishers have started in recent years to obsessively monitor the ways in which their readers arrived at their sites. The sheer speed with which Facebook, Twitter, Google and Snapchat have come to dominate the landscape has taken publishers by surprise. In 2014, Gawker Media’s founder, Nick Denton, wrote a memo to his staff that admonished them for giving in too fully to the influence of platforms, which drove many of his company’s most popular stories. “We — the freest journalists on the planet — were slaves to the Facebook algorithm,” he wrote. Looking back at 2015, however, Mr. Denton, once known for harsh assessments of the media business, struck a conciliatory tone. Mr. Denton said he was hopeful, like many publishers, that deep “niche” brands have something to offer advertisers. E-commerce partnerships, in which publishers are paid commissions by retailers for products recommended, or mentioned, on their sites, now cover the company’s editorial spending. The arrangement largely sidesteps social networks, but relies on agreements with another huge partner: Amazon. Other companies are looking to focus more on branded content like videos, sponsored stories and full-fledged campaigns. But publishers have quickly learned that those efforts are labor-intensive and put them in direct competition with advertising agencies. A broad slowdown in venture capital funding leaves even newer media companies with hard choices to make; even those built with social media in mind have been forced to fundamentally reconsider their plans.